HK Infosoft specializes in Joomla web development. Joomla being one of the best content management systems, our personnel provides the best web site and application services to the clients. Hundreds of free extensions written for Joomla that allows users to extend its functionality and customize it to their own objectives. Lets talk, move fast to begin your amazing project with our resources! Backed by seven years of experience, since the inception of Joomla technology, we have proved to improve our results in all the categories defining the concept of using such technology behind the services. 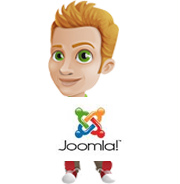 Whatever the means of requirements, we can execute all the services related to Joomla technology at your request. The total cost can be greatly reduced as you wouldn’t have to invest in the infrastructure and spend fortunes on hiring a permanent professional for limited work. Having a skilled professional will save time in training and management as the work can be started immediately. You can hire depending on your needs- whether it is related to a project requirement or time frame. There is no hassle of communication as the hired personnel will be directly in contact with your company to negate the chances of any miscommunication. Project specific skills can be accessed through hiring the resources which otherwise wouldn’t be a requirement for your company’s work. Total administration cost can be reduced effectively.